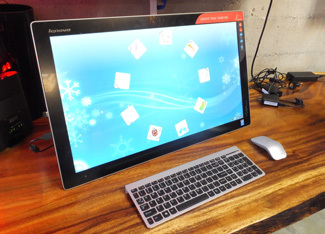 Lenovo focused on portability in its announcement of two new PCs at an event Monday in San Francisco. The Yoga 900 Convertible Laptop, its new flagship in the hybrid category, and the Yoga Home 900 Portable all-in-one. The 13” Yoga 900 convertible laptop enters the fastest-growing category of the PC market, tablet-capable laptops, battling main rivals Microsoft, Asus and HP. 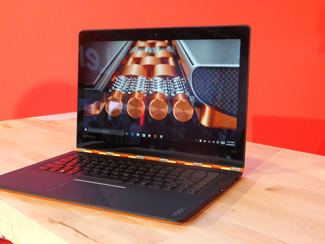 It comes out a year after its predecessor, the Yoga 3 Pro, and improves on the shortcomings of that model while only adding slightly to weight (2.8 lbs. vs. 2.6) and thickness (0.59” vs. 0.5”). 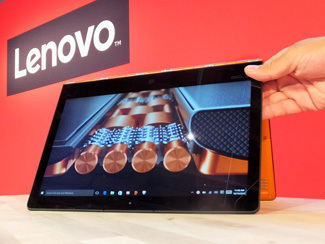 The Yoga 900 claims to be “the world’s thinnest Intel Core i convertible laptop,” and those qualifiers indicate where Lenovo innovated. The higher performance Intel Core i processors run hotter than the Core M of the previous model, so instead of a bigger, noisier fan, Lenovo kept the size and weight down with large vents hidden in the hinge and a new internal fan that is larger but slimmer and quieter. Lenovo’s improved “watch band” hinge also contributes to the slim size. It is a durable 360-degree hinge with gear sets that offer different resistance levels, pressure and tension stops for tent and stand modes. Consumers may not distinguish between convertible and hybrid laptops, but Lenovo does for the purpose of its “slimmest” claim. Hybrids have a removable keyboard. The downside is that a slim hybrid hinge like Microsoft’s Surface doesn’t have the stiffness to hold up the display on its own, so Microsoft’s hybrids include a kickstand, which is awkward for typing on one’s lap. 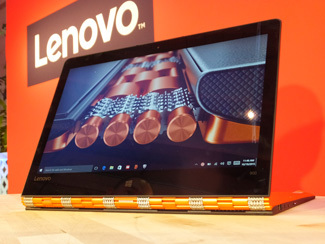 Lenovo is seeking the best of both worlds with its slim convertible. Battery density has improved by 50% over the Yoga 3 Pro, allowing up to 9 hours of video playback. The Yoga 900 also features a 13.3” 3200 x 1800 (16:9 aspect ratio) IPS touchscreen display, though it seems a little too glossy and reflective at times. It offers an SSD drive up to 512GB, 6th-generation Intel Skylake Core i5-6200U or the Core i7-6500U chip, up to 16GB RAM, Dolby DS1.0 Home Theatre, a USB Type-C port, two Type-A ports, and a 4-in-1 card reader. Consumers complained about the keyboard on the previous model, and the Yoga 900 returns to a full keyboard with function keys and comfortable touch. 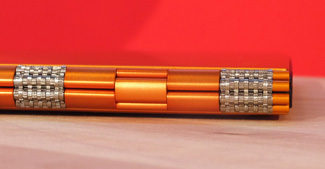 The outer color choices look rich: Clementine Orange, Champagne Gold, and Platinum Silver. It ships with Windows 10, and Lenovo worked closely with Microsoft to extend the functionality of Cortana, Microsoft’s answer to Siri, with the Lenovo app ReachIt. ReachIt boosts the power of Cortana, enabling it to perform smart voice searches for files located on any connected Lenovo PC or tablet you own and across multiple cloud services. Pricing is competitive compared to the competition at $1,199 for 256GB, and $1,499 for the 512GB model. It is available now at Best Buy. The new Yoga Home 900 adds “portability” to the small all-in-one category via an integrated 3-hour battery. 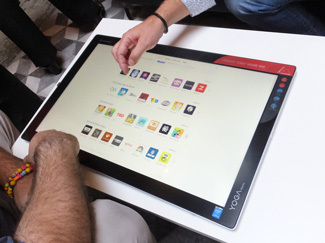 With a 27” touchscreen, hefty processing power, a “thin light design” and curated apps for the touch screen, Lenovo hopes to reach a new markets in bringing families and friends together. By day it is a productivity desktop for business, and by night it moves to the coffee table where it lies flat and becomes a game board for the whole family to play on. When tight budgets or small spaces call for a single all-in-one device to serve many roles, this PC fits the bill. The desktop has full PC capabilities with an Intel 5th generation Core i7 processor, optional Nvidia GeForce 940A graphics, and Windows 10. Other details were not yet released. It will ship at the end of October starting at $1,549.